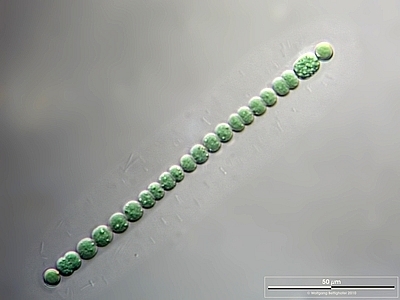 caption Colony of cyanobacteria in mucilaginous sheath. Scale bar indicates 50 µm. Sample from sphagnum pond situated in the northern alpine region of Austria near Salzburg. Images were taken using Zeiss Universal with Olympus C7070 CCD camera.